I’m not too big, the car is too small! 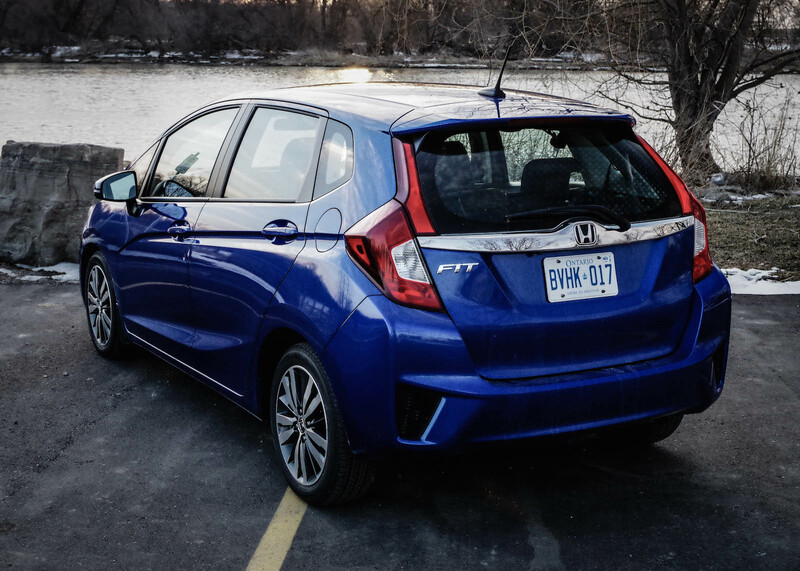 I was given the opportunity to drive the new Honda Fit EX-L Navi this week. For 2016, the model carries over unchanged. It was very good from the start, but I do have two minor complaints. The first is that anyone over six-feet tall will find legroom a bit tight; especially on a long drive (more on that in a bit). 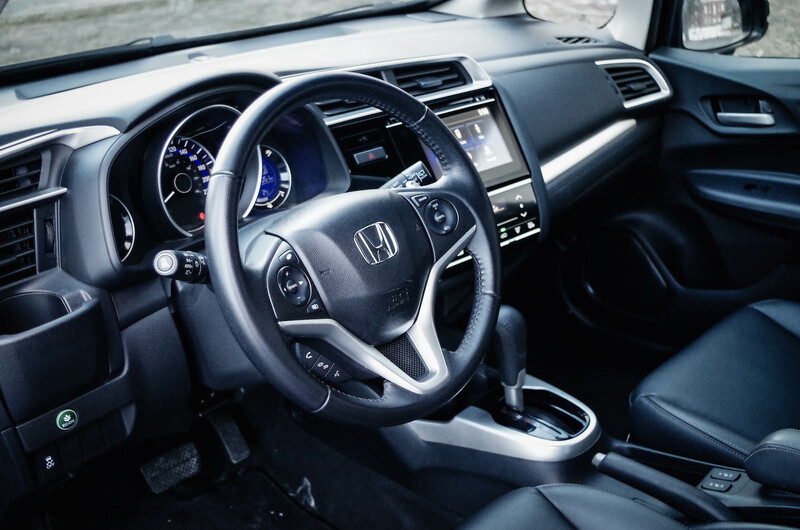 The second is the lack of any actual buttons and knobs to control the HVAC or infotainment. Be that as it may, those were the only negative traits that I could find. 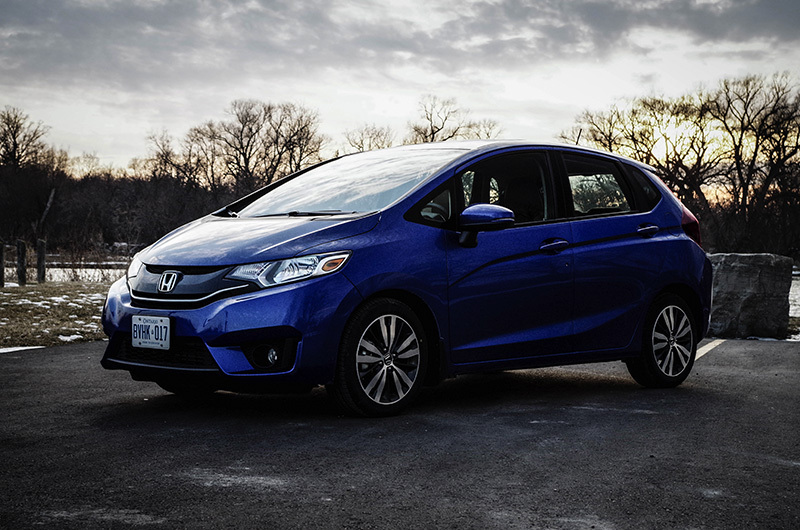 The Fit is a fantastic city car; perhaps the best city car presently being sold. To start with, it is very nice to look at. The Fit reminds me of the cartoon Mighty Mouse; a mouse that has spent too much time at the gym. It looks bigger than it actually is, giving the impression it will punch above its weight class. Now in the model’s third generation, one of the key exterior changes was to reduce the amount of glass. This means the windows are not as tall, which has in turn made the whole car look bigger, taller and more substantial. My top of the line EX-L Navi had the 16” alloy wheels that add that little extra garnish that makes the Fit standout in its class; especially compared to the base model whose wheels use hub-caps. 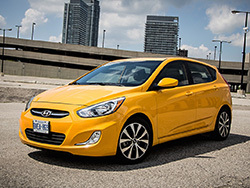 It also had fog lights and a sunroof, but these are also available on the EX model. The only exterior bits that are unique to the EX-L Navi are side mirrors with integrated turn signals. All models use the LED tail lights and all have heated power mirrors. Open the door and you will find a useful and surprisingly capable cabin. I was able to fit in the rear seat with only my knees slightly grazing the seat backs. I would not want to spend hours back there but a short ride would be fine. 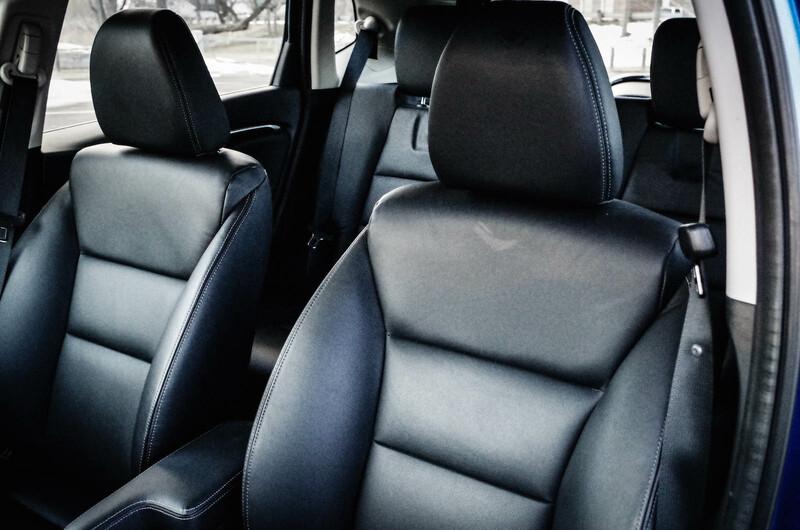 The seats in my test car were leather and comfortable all around. There was the issue of legroom however. My ride to pick up the Fit was just over three hours thanks to the brutal Toronto grid-lock that lasted well past 8 pm on the night in question. My drive home was a little over two. An hour into the return trip I started to cramp; first in the back, then the thigh, the calf followed and lastly my foot. The problem was the angle at which my foot needed to be held to access the throttle pedal. Using cruise control did not even help because there was nowhere else to put my foot. So the only change I would make interior-wise would be a touch more legroom for the driver. Of course, I do stand six-feet tall, so this would not be a problem for everyone. The interior fit and finish is impressive for what is essentially an economy car. There is a lot of plastic but the pieces are assembled with a good degree of precision. 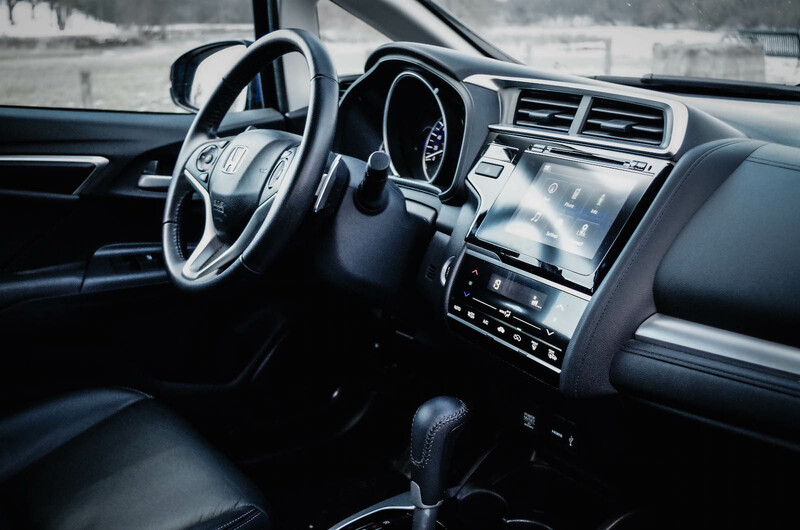 The small cabin has several cup holders up front, including a collapsible one located just left of the steering wheel; a great spot as it does not require the driver to look for their beverage or lean to reach it. 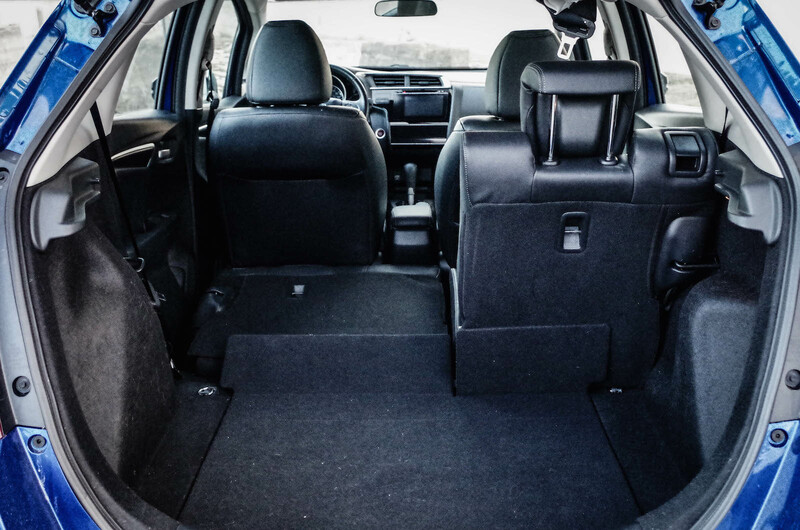 The reclining rear seats handily fold into the floor leaving a flat cargo area with an impressive 1,492 L of volume. We now come to my second issue – the lack of buttons and knobs. Honda has seen fit (no pun intended) to do away with any real controls for the HVAC and infotainment system in favour of virtual switches. Trouble is the virtual system is not the easiest to learn or use. 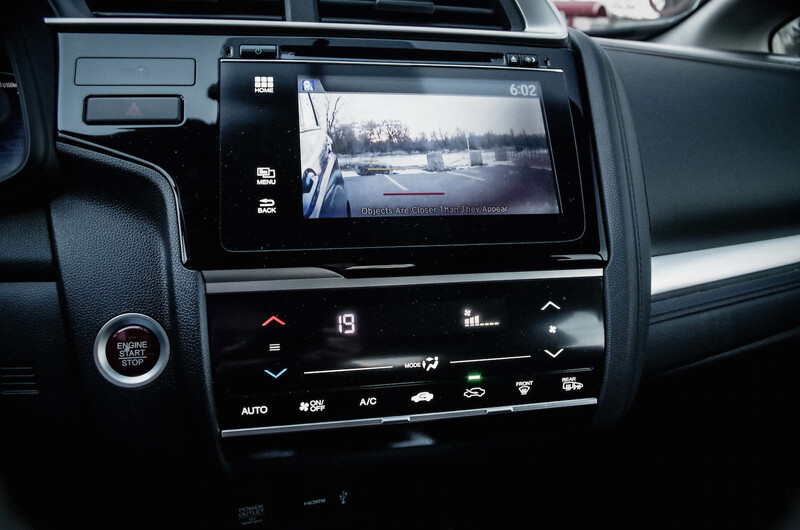 The driver will have to take their eyes off the road to adjust the temperature for instance. There are radio controls on the steering wheel but I personally like to see what channel I am selecting rather than leave it to chance. I say chance because my wife has almost certainly reprogrammed every single station within moments of sitting down in the passenger seat. 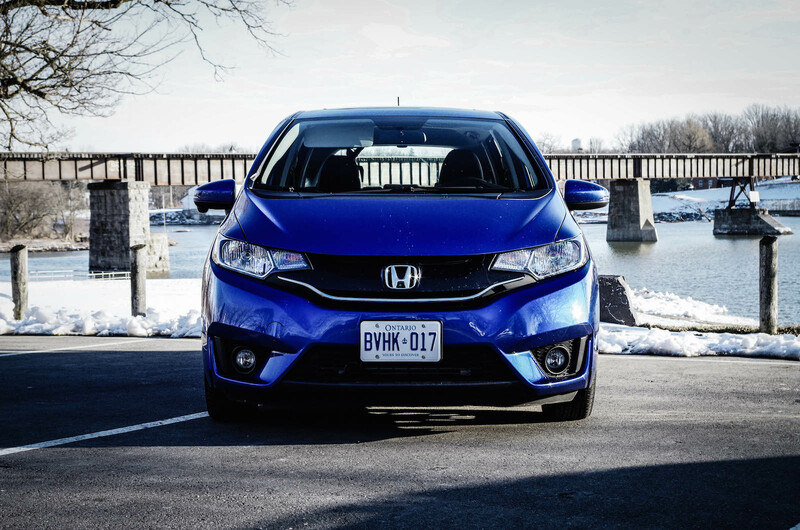 On the plus side, the Fit uses the infotainment display for a great safety feature. As soon as you signal a right turn, the screen displays the image captured by a camera located under the right side door-mirror. 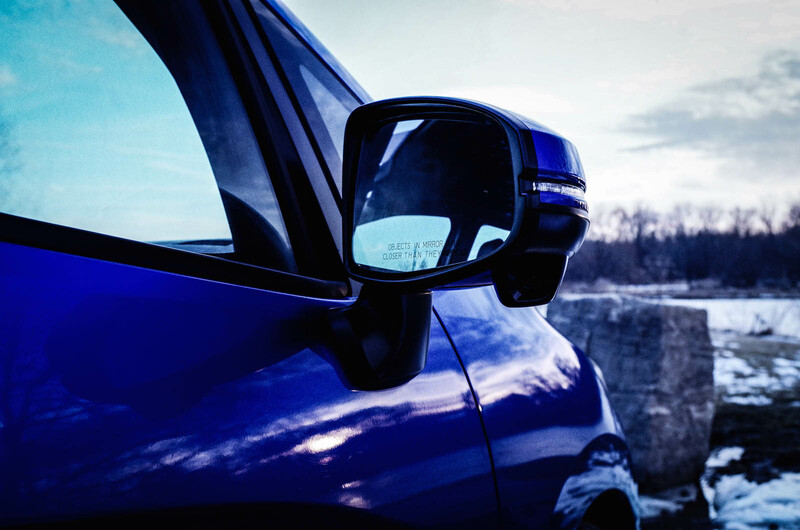 This means you have no blind-spot worries. It even gives you a graduated distance display to help you determine just how far back an object is. 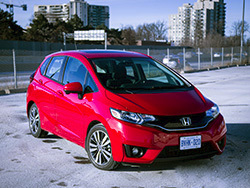 The revamped Fit received a new engine and powertrain for the 2015 model year. All trims use the same 1.5L 4-cylinder i-VTEC engine that moves this little car around rapidly. 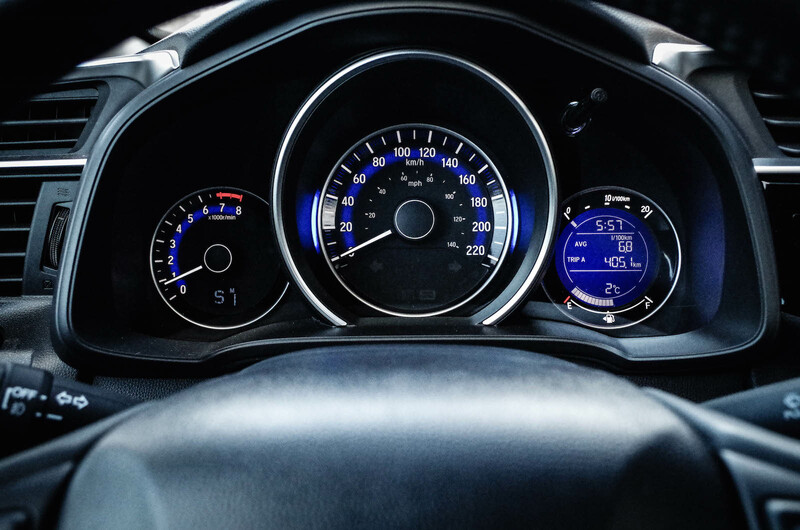 The engine displays the rev-happy nature typical of all Hondas and has more than enough grunt to keep up and pass traffic at highway speeds. Uncharacteristic of such a small engine, it does so without much fuss nor a lot of noise. This may be partially due to the devils work unfortunately. You see Honda has employed the dark arts and joined Team CVT. This specific CVT does a good job of keeping the revs to a minimum, but does cause the drone we dislike so very much. To circumvent the irritating “slipping clutch” effect of this transmission, I kept it in Sport Mode and used the paddle shifters. Doing so made every drive far more engaging, but if you want the full go-kart experience, all trim levels can be had with a 6-speed manual. Driving the car, as one of my passengers put it, is like “driving a bee”. It bobs and weaves through traffic effortlessly. 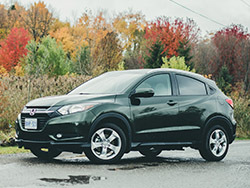 The torque available off the line makes getting ahead of the herd a snap and the diminutive size makes finding a parking spot a joy rather than the stressful ordeal larger vehicles must endure. The turning radius is ridiculous. One lane and a bit is all it takes to do a U-turn and the nimble handling makes dodging potholes a game; sort of like Mario-Kart in real life. At the end of my week, during which I drove only in Sport and in no way tried to be green, I averaged 6.8 L/100km, which is incidentally what Honda claims. That means they must have realized that we would drive this car in an all-out sort of way and adjusted their estimates accordingly. If you are not prone to such frivolous driving you will likely see even better fuel numbers. 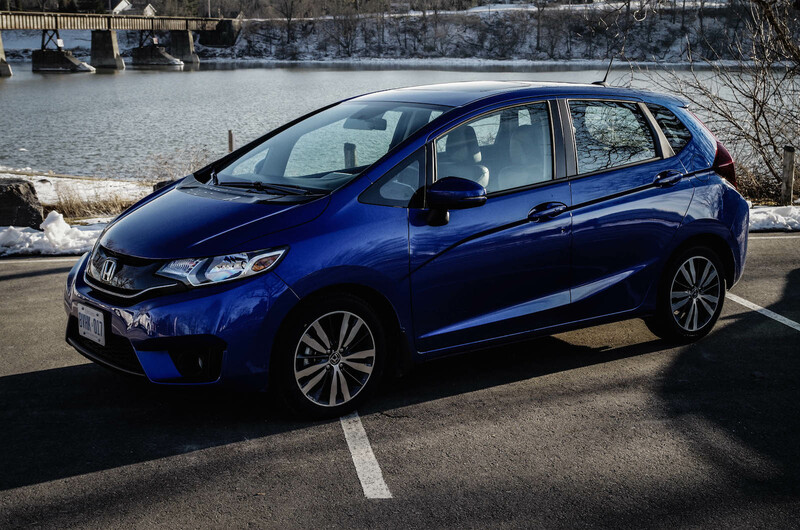 The Fit continues to be the benchmark that all city cars aspire to. There is enough room for five, the engine makes it possible to do long highway drives without fear of inadequacy, and most important of all, in my mind anyway, is the fact that it is fun to drive. Yes it has a few rough edges but there is nothing else out there that offers this combination of sensible packaging, practicality, handling, and Honda’s reputation for reliability.